Unquestionably one of the all-time most influential, important, and versatile guitarists and songwriters in rock history is Jimmy Page. Just about every rock guitarist from the late '60s/early '70s to the present day has been influenced by Page's work with Led Zeppelin -- his monolithic riffs served as a blueprint for what would eventually become heavy metal, yet he refused to be pigeonholed to any single musical style (touching upon folk, country, funk, blues, and other genres). Page also lent a hand in writing (or co-writing) Zeppelin's vast array of classic songs and produced all their albums. Born on January 9, 1944, in Heston, Middlesex, England, Page picked up the guitar at age 13 after being inspired by the Elvis Presley tune "Baby Let's Play House," and while he took several lessons, was mostly self-taught. Instead of attending college right after high school, Page decided to join his first real rock band, Neil Christian & the Crusaders, whom he toured England with. But Page fell seriously ill (with glandular fever) and was forced to quit and recuperate. Dejected, Page pondered giving up music and focusing on another interest, painting, as he enrolled at an art college in Sutton, Surrey. With the emergence of such bands as the Rolling Stones in the early '60s and their gritty blues-rock, Page's interest in music perked up once again -- but instead of forming a band right away, he decided to hone his craft by becoming one of England's top session guitarists and producers. Although the exact specifics of which sessions he was involved with have become hazy over time, it's confirmed that he worked with many of the day's top acts, including the Who, Them, Donovan, the Kinks, and the Rolling Stones, among others. 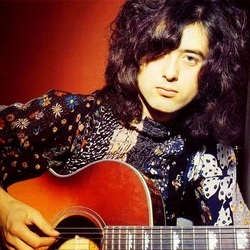 By 1966, Page was looking to put his session work on hold and join a full-time band; he accepted an offer to play with the Yardbirds (initially as a bassist, then shortly thereafter as a guitarist), as he was paired up with another one of rock's all-time guitar greats, Jeff Beck. Although the Yardbirds began as a straight-ahead blues-rock band, with the inclusion of Page in the lineup, the group began experimenting with psychedelic and hard rock styles.